SkyGreece Airlines, S.A. on September 3 announced that, with the authorization and approval of its board of directors, the company has filed a Notice of Intention to Make a Proposal (Notice of Intention) pursuant to the provisions of Part III of the Bankruptcy and Insolvency Act (BIA) (Canada). Pursuant to the Notice of Intention, Ernst & Young Inc. (EY) has been appointed as the trustee in the company’s proposal proceedings (the Proposal Trustee) and in that capacity will monitor and assist the company in its restructuring efforts. It was determined by the company’s board of directors that as a result of the company’s current financial situation, seeking protection under the BIA would be in the best interests of the company and all of its stakeholders. This was a very difficult decision for SkyGreece. The company ultimately determined that this was the best course of action to ensure that all of its creditors, including passengers, were treated equitably. While under BIA protection, the company will continue with its efforts to resume service, while determining the best way to see that all parties are compensated fairly. A Notice of Intention is the first stage of a restructuring process and allows the company to pursue a restructuring of its financial affairs and operations, through a formal Proposal to creditors. This filing has the effect of imposing an automatic stay of proceedings (Stay) that will protect the company and its assets from the claims of creditors and others while the company pursues its restructuring. SkyGreece was founded with a commitment to providing economical, customer-focused air travel between Athens, Toronto, Montreal, Budapest, Zagreb and New York. In spite of its recent challenges, the company looks forward to serving passengers again soon and to doing everything it can to take care of those passengers who have been recently affected. SkyGreece is actively working to quickly improve customer communications by establishing a customer and creditor support centre, which it hopes to have operational in the coming days. Copyright Photo: TMK Photography/AirlinersGallery.com. SkyGreece Airlines Boeing 767-31A ER SX-BPN (msn 26470) is pictured sitting at Toronto’s Pearson International Airport (YYZ). This entry was posted in SkyGreece Airlines and tagged 26470, 767, 767-300, 767-31A, Boeing, Boeing 767, Boeing 767-300, Pearson, SkyGreece Airlines, SX-BPN, Toronto, YYZ on September 4, 2015 by Bruce Drum. SkyGreece Airlines (Athens) on May 23 started twice-weekly service to Montreal (Trudeau) and Toronto (Pearson) from Athens. The airline is also serving Canada from Budapest. The new Greek trans-Atlantic Airline was founded by Greek expatriates from Canada and the USA. Operations commenced in 2014. Copyright Photo below: TMK Photography/AirlinersGallery.com. Boeing 767-31A ER SX-BPN (msn 26470) arrives at Toronto (Pearson). This entry was posted in SkyGreece Airlines and tagged 26470, 767, 767-300, 767-31A, Athens, Boeing, Boeing 767, Boeing 767-300, Budapest, Canada, Montreal, Pearson, SkyGreece Airlines, SX-BPN, Toronto, YYZ on June 1, 2015 by Bruce Drum. 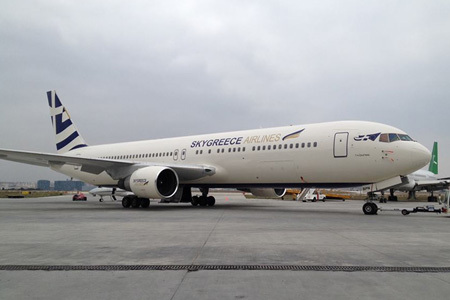 SkyGreece Airlines (Athens) is planning to launch Boeing 767-300 ER passenger operations from Athens later this month. The airline plans to fly to North America (New York, Montreal and Toronto) but initially will operate weekly services from ATH to Asmara (starting on June 21), London (Gatwick) (July 5), Mogadishu (June 22) and Stockholm (Arlanda) (June 19) per Airline Route. SkyGreece Airlines S.A., a new Greek trans-Atlantic airline, founded by Greek expatriates from Canada and the USA, has acquired all necessary permits from the Hellenic Civil Aviation Authority and the Greek Ministry of Transport. After the scheduled test flight on March 21, 2014, that included HCAA executives, the Company fulfilled all required legal procedures, and is ready to commence flight operations worldwide. Concurrently, documentation has been submitted to the American and Canadian Civil Aviation Authorities, in order to obtain the necessary licenses and launch in its initial phase, scheduled flights from Athens to New York, Toronto and Montreal. In the meantime, the Company will conduct selective charter flights. 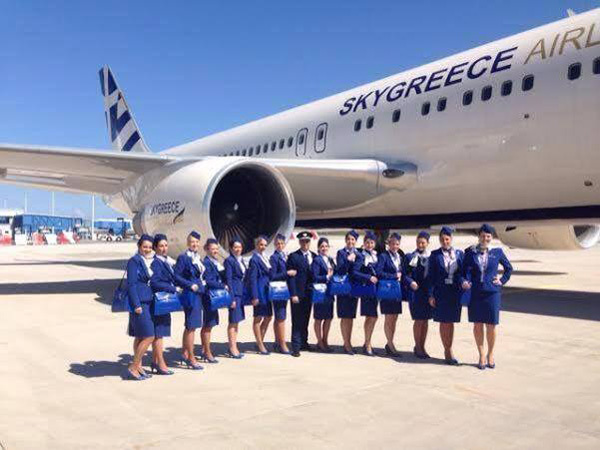 SkyGreece Airlines S.A. is staffed with experienced personnel in the aviation industry whose main goal is to unite Greece with the Greek diaspora. The Company operates in Markopoulo Attica, Montreal and Toronto, with future offices in New York. The first aircraft of SkyGreece Airlines S.A. is a Boeing 767-300 ER, named “Taxiarchis” that has 274 seats, and hosts a distinctive Greek flag on its tail. 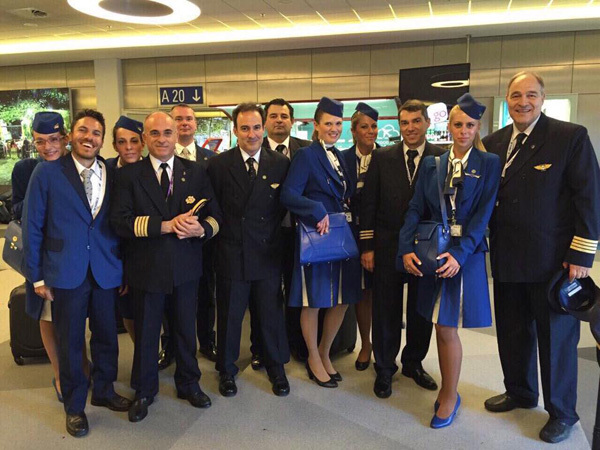 The airline expects to enter the market dynamically with trans-Atlantic flights all in Greek traditional hospitality. It is currently in the process of acquiring a second aircraft. We would like to inform you, that in order to respect the American and Canadian Civil Aviation procedures, SkyGreece Airlines S.A. will not be issuing another press release until all above licenses as required by law, have been obtained. 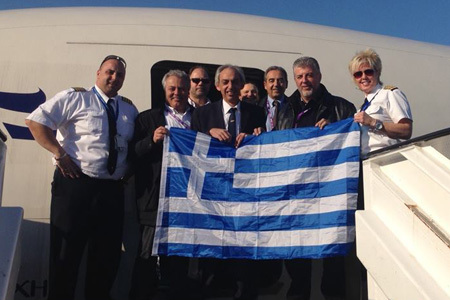 SkyGreece Airlines S.A. is grateful to the diaspora and the Greek State for their total support and cooperation. Copyright Photo: SkyGreece Airlines. The flight crews stand in front of Boeing 767-31A ER SX-BPN (msn 26470). 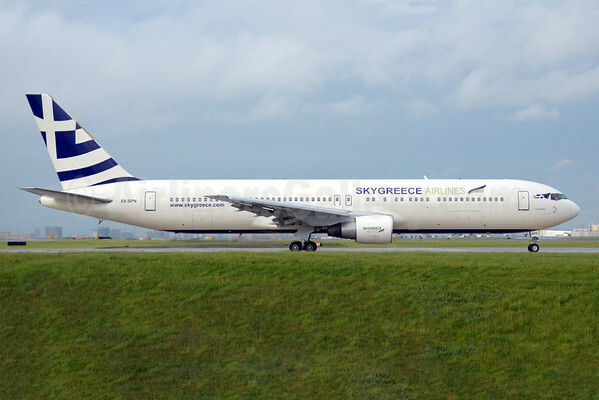 This entry was posted in SkyGreece Airlines and tagged 26470, 767, 767-300, 767-31A, ATH, Athens, Boeing, Boeing 767, Boeing 767-300, Hellenic Civil Aviation Authority, Montreal, SkyGreece Airlines, SX-BPN, Toronto on June 12, 2014 by Bruce Drum. 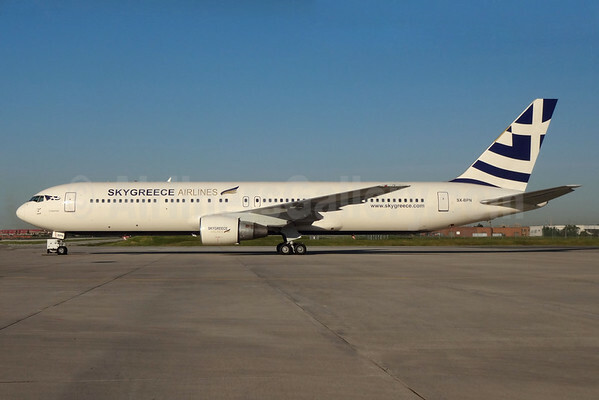 SkyGreece Airlines (Athens) is a new Greek airline with its first Boeing 767-300. Boeing 767-31A ER SX-BPN (msn 26470) (above) was delivered to the new airline on December 14. The newcomer is planning to launch trans-Atlantic flights to New York, Montreal (Trudeau) and Toronto (Pearson). The airline was founded in October 2012 by Greek and Canadian aviation professionals. Copyright Photos and Images: SkyGreece Airlines. This entry was posted in SkyGreece Airlines and tagged 26470, 767, 767-300, 767-31A, Athens, Boeing, Boeing 767, Boeing 767-300, SkyGreece Airlines, SX-BPN on December 16, 2013 by Bruce Drum.